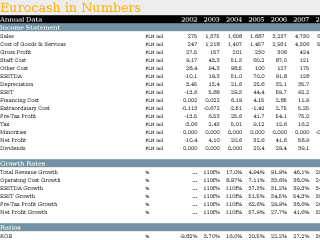 This Annual Statistical Dossier offers a summary of Eurocash's performance between 2002 and 2017 on an annual basis. 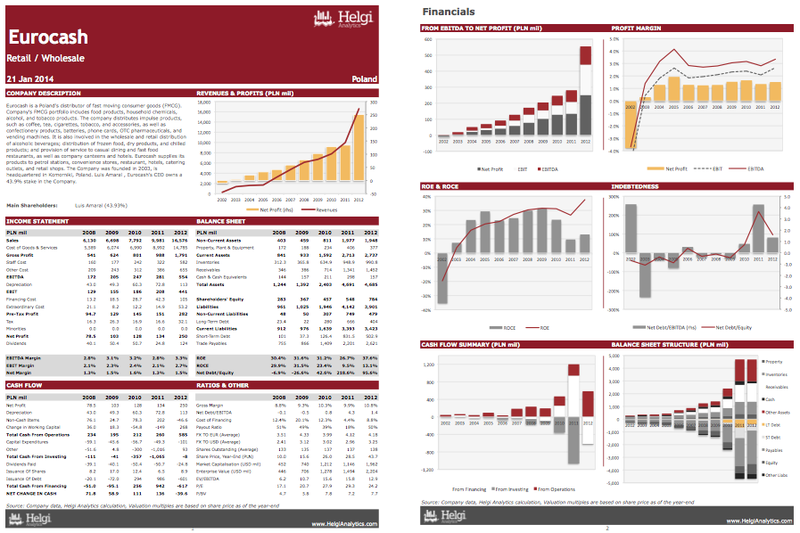 The report can be downloaded as an Excel file. 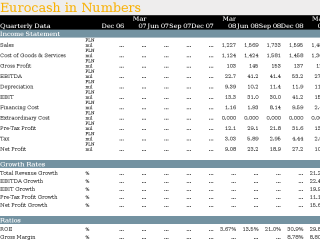 This Quarterly Statistical Dossier offers a summary of Eurocash's performance between Dec 06 and Sep 18 on an quarterly basis. The report can be downloaded as an Excel file. Eurocash is a Poland's distributor of fast moving consumer goods (FMCG). Company's FMCG portfolio includes food products, household chemicals, alcohol, and tobacco products. The company distributes impulse products, such as coffee, tea, cigarettes, tobacco, and accessories, as well as confectionery products, batteries, phone cards, OTC pharmaceuticals, and vending machines. It is also involved in the wholesale and retail distribution of alcoholic beverages; distribution of frozen food, dry products, and chilled products; and provision of service to casual dining and fast food restaurants, as well as company canteens and hotels. Eurocash supplies its products to petrol stations, convenience stores, restaurant, hotels, catering outlets, and retail shops. The Company was founded in 2003, is headquartered in Komorniki, Poland. Luis Amaral , Eurocash's CEO owns a 43.9% stake in the Company. Eurocash's net debt reached PLN 609 mil and accounted for 0.620 of equity at the end of third quarter of 2018. The ratio is up 34.2% when compared to the same period a year ago. Historically, the firm’s net debt to equity reached an all time high of 1.07 in 1Q2015 and an all time low of 0.150 in 4Q2015. When compared to EBITDA, net debt amounted to 1.68x at the end of the period. The ratio reached an all time high of 2.14 in 1Q2014 and an all time low of 0.367 in 4Q2015. You can see all the company’s data at Eurocash Profile, or you can download a report on the company in the report section. Eurocash stock traded at EUR 18.1 per share at the end of the third quarter of 2018 translating into a market capitalization of USD 685 mil. At the end of 3Q2018, the firm traded at price to earnings of 38.4x. Within the last five years, the multiple reached an all time high of 158x in 3Q2017 and an all time low of -125x in 4Q2017 with an average of 4.03x. In terms of EV/EBITDA, the stock traded at 8.68x at the end of the third quarter of 2018. Since 3Q2013, the multiple reached an all time high of 19.3x in 3Q2017 and an all time low of 8.68x in 3Q2018 with an average of 14.0x. Eurocash made a net profit of CZK PLN 38.2 mil under revenues of PLN 6,256 mil in third quarter of 2018, up 6.11% and 8.33%, respectively, when compared to the last year. This translates into a net margin of 0.296%. Historically, the firm’s net margin reached an all time high of 1.65% in 4Q2010 and an all time low of -0.157% in 1Q2018. The average net margin in the last five years amounted to 0.796%. On the operating level, EBITDA margin reached 0.738% and EBIT amounted to 1.64% of sales in the third quarter of 2018. Eurocash made a net profit of PLN 38.2 mil under revenues of PLN 6,256 mil in the third quarter of 2018, up 2.04% and up 12.2% respectively, when compared to the same period last year. This translates into a net margin of 0.296%. Historically, the firm’s net profit reached an all time high of PLN 121 mil in 4Q2012 and an all time low of PLN -61.8 mil in 2Q2017. Since 3Q2013, the firm's net profit has increased 162% or -14.4% a year on average. On the operating level, EBITDA reached PLN 105 mil, up 3.61% when compared to the previous year. Over the last five years, company's EBITDA has grown -2.12% a year on average.